Riding motorcycles is an inherently more dangerous mode of transportation than driving in a car. Unlike a car, there is nothing to protect a rider from the impact of a car, the concrete or a stationary object on the side of the road. Most bikers and motorcycle owners are aware of the dangers of riding a motorcycle ahead of time and prepare before each ride to make sure they are as safe as possible while on the road. 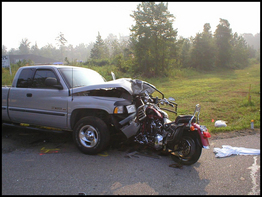 It is a well known fact that Motorcycle accidents are not caused by the rider, but rather by other factors. It is also a well known fact that motorcycle accidents tends to produce severe injuries like spinal cord and brain trauma, loss of limbs, paralysis or even death. Motorcycle accidents have many causes including dangerous roads and highways, operators of cars and/or trucks not paying attention while driving, and faulty motorcycle design and mechanical defects. Victims of motorcycle accidents are twenty-five times more likely to be killed and five times more likely to be injured in an accident than a passenger in a car. The cost of medical treatment and the loss of income suffered on the part of the operator of the motorcycle are generally much greater than that in other motor vehicle accidents. Call The Police Immediately: This may sound like an obvious thing, but there are cases where the parties decided not to call the police and that had a negative effect on the injured party. Need to Issue Ticket: It is important to make sure that the Police issue a citation to the at fault party in order to establish liability. Driver Information: Exchange information with all other drives. This includes their names, license number, tag number, insurance company name and their policy number. Photographs: Take photographs of your physical injuries, damages to the vehicles and the scene of the accident. Also take photographs of the license plates of each car involved in the accident. Most of the cell phones today have cameras built into them. Draw a Diagram of the Accident Scene: Write the date and time of the motorcycle accident on the diagram. In addition, write down information about the location, including the intersection, street names, any stop lights or traffic control signs, and other landmarks. Witnesses: Attempt to get a record of all names, addresses, phone numbers and email addresses of people who witnessed the accident. Additionally, contact the witnesses for a statement before too much time has passed. Medical Expenses: Keep a record of all doctor office visits, medication (over the counter medications & prescriptions), tests and laboratory services, physical therapy, hospital visits, medical treatments and documents, diagnostic services including all types of x-rays and scans. Make sure you write down the names of the doctors, dates of visits, amount charged, and the reason for the visit. Lost Time: Document all lost time from work or school or any other activity that you would normally do. Include as much information as possible regarding the lost time, including the name, date and location of the missed activity. Diary: Keep a daily diary of your thoughts, feelings and experiences. You should document how the injuries have interfered with your daily life and relationships. Car Repair Estimates: Keep a record of all expenses and estimates of repair for your damaged vehicle. This includes temporary replacement transportation like the cost of a car rental. Out of Pocket Expenses: Keep all receipts related to your injury that you have paid for out-of-pocket. These expenses could include, heating pads, ace bandages, child-care expenses, cancellation of a vacation trip or event, clothing, etc. You need to seek medical attention immediately after the accident and do not admit fault. Diligently follow through with all medical treatments. Do not answer any questions from the other side's insurance company, attorney or sign any forms without consulting your own legal advisor. Do not settle your case until all necessary medical expenses, present and future, are known. Keep copies of everything. Finally, contact a lawyer. It is very important when dealing with insurance companies, that you have a qualified lawyer on your side to negotiate the best financial settlement for you and your family. If you were severely injured in a car accident due to the negligence of the other driver or drivers, hiring a lawyer is in your best interest to protect your rights and to ensure that your family is fairly compensated for your financial losses, pain and suffering.